Nurse leaders, researchers, and evaluators face a vital problem in the profession: how to successfully translate evidence-based research into health policy. In this book, seasoned researchers share their knowledge, skills, and expertise on the most important aspects of the research enterprise and its connection to policy implementation. Readers will learn how to: Identify the relevant health care issues that policy makers are concerned with, collect and manage data that will influence policy discussion, translate statistical significance into policy at the institutional, state, and federal levels, secure appropriate funding for research on issues in nursing education, the workforce crisis, and more, and determine how Congressional processes affect federal funding and budgeting. 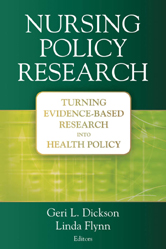 Dickson and Flynn provide the necessary tools to turn evidence-based research into health policy. With these tools, researchers will not only improve their capacity to influence policy decisions, but will take part in the advancement of the profession at large.